Winners of the 2009 AVA Presidential Award. We believe that we live in beautiful country and would like to share our love of the Black Hills of South Dakota and Bear Lodge Mountains of Wyoming through our volkssport events. Some of our walks are on trails in the Black Hills National Forest (under special use permits), some walks are in historic Gold Rush towns, some walks visit military posts of the past, some walks feature the local community's character--each event is unique and beautiful. Come check us out and meet us on the trail. 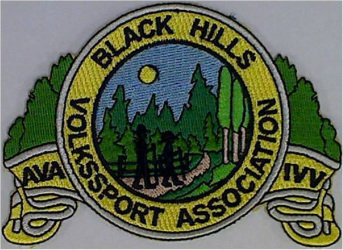 The Black Hills Volkssport Association was formed in Rapid City in 1982 and is part of the American Volkssport Association (AVA) in the International Federation of Popular Sports (IVV), which debuted in the United States in 1976. Volkssporting, which means "the sport of the people", originated in Europe in the mid-1960's. All of the events described on these pages are fully sanctioned under the American Volkssport Association. The mission of the AVA and IVV is to promote family fitness and fun through community participation in sanctioned Volkssporting events. Volkssporting includes outdoor sporting events such as walking, cross-country skiing, biking, skating and swimming. selected for the walkers' enjoyment and all events are non-competitive. Volkssporting events are open to everyone. People of all ages or physical conditions are encouraged to participate. The American Volkssport Association as over 350 active clubs which sponsored over 3000 walks throughout the United States. choosing to take part in the International Achievement Awards Program or to receive a special memento for the event. donations. Donations to help with future events are cheerfully accepted. In order to support volksports in South Dakota, walkers are encouraged to register and receive the benefits of awards and incentives. All walkers at Crazy Horse must be registerd and pay the $3.00 fee to walk (in addition to admission to Crazy Horse-which in recent years has been cans of food for area food pantrys). For awards and incentives all participants must register by completing a start card, carrying the start card with them throughout the event, and surrendering the card at the completion of the event. Registration can be accomplished anytime during the advertised start times, but all walkers must be off the trail by the advertised end time. The American Volkssport Association and its officers, members, and agents shall not be liable or responsible for, and shall be held harmless for and against any and all claims and damage to loss of property arising out of, or attributed to the operation of events conducted by the AVA. All attempts will be made to create a safe, enjoyable walk.